This highly subjective list has been compiled from personal recommendations, user input and reviews and rankings published by other Web and media sources. These other state-focused sources include NJ.com, NorthJersey.com, AsburyParkPress.com, NewJerseyMonthly.com, BestofNJ.com, Philly.com, as well as national sites such as Yelp.com, TripAdvisor.com and Facebook.com. The list will be periodically updated and supplemented, and we welcome comments and suggestions. Store owner Joanne Faruggia and staff personally test nearly all toys and games> Located in Palmer Square across from the Nassau Inn, also sponsors special events such as book signings and musical programs. Family-owned, specializes in vintage toys and games for young and old, as well as latest offerings. Classics from LEGO, Disney, HotWheels etc. Located in picturesque center of Warren County off I-80. Two locations in Manhattan under name Kidding Around at Union Square and within Grand Central Terminal> Montclair store included as one of best independent toy stores in NJ in BestofNJ.com, carries wide range of games, toys, books and puzzles selected for inspiring creativity by proprietor Christina Clark> Action figures, puppets, trains and wooden toys, costumes. Named among 3 best Kitchenware Stores in NJ 2017 by NJ Monthly> Founded 2008 by proprietor Ben Salmon: "I’m completely dedicated to finding the most useful, unusual and sensationally fun items that will change the way your kitchen operates"> Rated 4.9 of 5 stars by 56 reviewers on Facebook> Star-Ledger: "colorful shop that’s cozy without being cramped, well-stocked without feeling overly cluttered and niche without feeling limited." Founded 1975 with first store in Voorhees, now nine locations with six stores in PA, including two in Philadelphia, one in Wilmington, DE> Selection of gourmet cookware, bakeware, kitchen knives and gadgets> Moorestown store features Cooking School with classes ranging from Cooking for Kids, Couples 5-star Cooking, to Girl's Night Out Classes and Private Birthday Parties> Named among 3 best Kitchenware Stores in NJ 2017 by NJ Monthly> Princeton Packet: "...proverbial 'toy store' for kitchen buffs, and a great source of information for those who aren’t too sure of themselves around the stove and broiler"
"Best Home Accessories" winner in 2017 Best of Philly rating by Philadelphia Magazine> Designer home goods and furniture, exclusively represents high-end contemporary Edgewood Made furniture line> Features original work by local and national designers and makers using natural materials, including wood, ceramics, metal, glass and textiles, in limited edition or small to middle batch production lines> Tabletop items include mugs, bowls, knives, cutting boards, also baskets, bags, candle holders, quilts. A fixture in downtown Princeton since 1970s, houses over 150,000 titles of mostly vintage vinyl LPs, CDs and DVDs, one of largest selections of any independent music store in Northeast. NY Times: "For better or worse, it’s all here....,plenty of contemporary rap, metal, Goth and hip-hop; DVDs, laser discs, computer games and Blu-rays. But the main appeal of the Princeton Record Exchange is vinyl for all conceivable tastes and then some." New and used musical instruments, vinyl albums, CDs, and DVDs, wide variety of sheet music: new single sheets, best sellers, regions solos, Broadway, instrument studies, and more> Used and new guitars, accessories for woodwinds, horns, and string instruments> Hosts in-store performances> Patrons include Bruce Springsteen. Established 1956, promotes selection of "all things vinyl" as "best in Northern New Jersey"> Covers current and classic titles "from rock to jazz and every genre in between"> Also turntables, cleaners, receivers, speakers, CDs and some 78s, rock T-shirts, books, posters, vintage memorabilia and recycled vinyl crafts> 3.5 of 5 stars from 38 reviews at Yelp.com. Sells instruments, accessories and offers repair and lessons> Opened 2002 by musician Mark Daizell, who began building violins and violas at age 15 his home in Ottawa, since bought, sold and fixed nearly every instrument and brand, including period medieval/renaissance instruments to state-of-art digital and MIDI capable violins and guitars> Instruments and accessories include guitars, basses, percussion, band/orchestral and recording/audio, also selection of recording and audio accessories from Behringer, Shure, RapcoHorizon and others. "Best Music Store" in 2017 Best of Philly ranking of Philadelphia magazine> Carries wide selection of new and used acoustic guitars, drums, basses, amps, also guitar repair, instrument rental> Brands include Gibson, Taylor, Martin, Fender> Founded 1960. Davis & Co; Story & Clark; Schulze Pollmann; Samick; Bechstein Sauter; Conover Cable; Sohmer; Hobart M. Cable; Falcone; Weber and others> Music Academy provides private lessons on all instruments from certified music instructors teaching all types of music including Classical, Jazz, Popular, Rock> Family owned and managed by Enrico 'Rick' Aquino III, holds masters in piano performance and music education degree, performed at Carnegie Hall and Lincoln Center. Operating for over 40 years> Represents contemporary artists, Tracy Pollock, Nick Savides, Anna Wainright and Rhoda Yanow, also specializing in buying and selling 18th-early 20th century American art, works of Johann Berthelsen, Frank Wayland Fellows, Lee W. Hughes, and more. A major US auction house and gallery with $33 million in annual sales founded and headed by David Rago, well-known for many appearances as ceramics and porcelain expert appraiser on TV's Antiques Roadshow, also author of five books and many articles> Online and on-site auctions, also private sales, as well as appraisal services for estates, insurance> Specialties also include modern design, contemporary art, Asian art, jewelry, silver, coins> Walk-in Valuation Day for visitors to learn about context and value of possessions with no appointment or obligation> One of 250 Best Auction Houses Worldwide in 2016 Art+Auction review. Founded 1987, offers investment-caliber works from internationally renowned contemporary European and North American artists> Collection evolved from handful of French artists to over fifty artists from France, China, England, Italy, Spain, Poland, Russia, Ukraine, Holland, Ireland and North America> Features Classical Impressionism, Post Impressionism and Contemporary Impressionism displayed on two floors. Founded 1992, seeks to make quality art available to all income groups at affordable prices> Offers paintings, photography, sculpture by African American, American, Asian American, Haitian, Latin American, Native American, and women artists, including Roberto Estopinan, Ismael Gomez, Grace Hartigan, Emma Amos, Lazaro Saavedra, William H. Littlefield and Ramon Lombarte. Owned and operated by second generation art dealer, Laura Borghi> Specializes in American and European paintings from late 19th, 20th, and 21st centuries> Artists include Cecil Bell, Emile Carlson, Ralston Crawford, Tom Dash, Jay Dorfman, Hermann Herzog, Sheryl Intrator, Alice Jacob, Jon Koones, Andre Lanskoy, Paton Miller, Xue Mo, Bradley Narduzzi Rex, John Stango, Clintel Steed, and Michael West. Located on main street of downtown Lambertville> Carries selection of representational oil paintings and sculpture by notable, living artists from around country, only displays work of artists which it represents, including Barbara Applegate, Tracy Avant, Cindy Baron, Susan Blackwood, Howard Friedland, Michael Godfrey, Joseph Orr, Neil Patterson, Marianne Caroselli, Elizabeth Robbins, Magret Short, Jason Tako, Leonard Wren, several others> Does not purchase or offer art appraisal services. Buys, sells and appraises rare coins and collectibles, including US coins and currency back to colonial times, foreign coins including Roman Empire> Also military and history books and artifacts; jewelry and watches; dolls etc.> Highest 5-star rating and Certificate of Excellence from TripAdvisor.com. 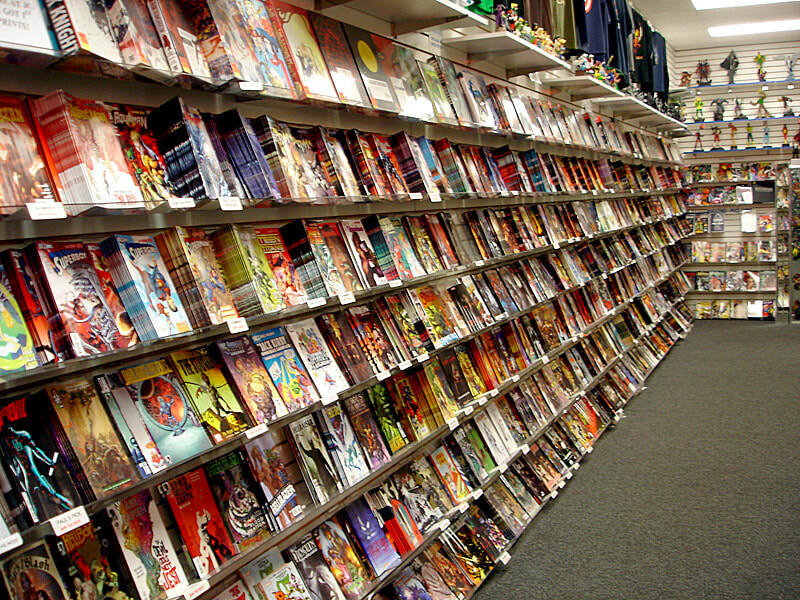 Vintage and current comic books, toys, figures> Facebook comments: 'definitely best comic book store in New Jersey'; 'awesome'; 'best comic store I've ever been to! '; 'atmosphere is wonderful, with a great selection from DC/Marvel to IDW and Action Lab!! My son enjoys visiting the shop for either his pokemon cards, comics or toys'. Family business established 1999> New and vintage comic books dating to 1940s, also trade paperbacks and novels, new and vintage toys, Bowen, Sideshow and DC statues and busts, Marvel Select and Marvel Universe action figures, DC Universe/ DC Direct action figures, Star Wars toys: Pop Vinyl and other Funko products, Magic, Pokemon, Yugio, non-sport cards. 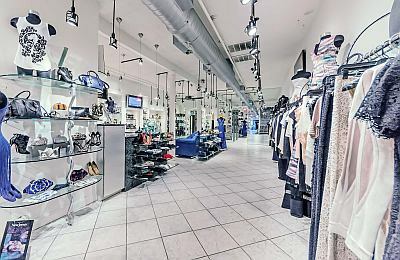 Women's upscale boutique, as well as men's designer shoes, in sleek, all-white 10,000 square foot, three-story store in central Red Bank, other location at original shop in Deal> Designer clothing from Hervé Léger, Cushnie Et Ochs, Jitrois, Alexander McQueen, Stella McCartney, Victoria Beckham and more; shoes from Jimmy Choo, Christian Louboutin, Valentino, Alexander McQueen; handbags by Chloe, Valentino, Alexander McQueen, Christian Louboutin> Headed by chief buyer and former model Kimberly Landau. Original focus on winter sports equipment including skis and snowboards, now expanded into high quality men's and women's apparel and action sports accessories, wide selection of outerwear and boots, gloves, hats, hoodies, flannel, sweats, denim> Established 2012 by partners Christopher Francois and Alexander Aronoff> Highest 5-star rating from 8 reviewers on Yelp.com. Founded 1991, sponsors frequent author book and poetry readings, storytime for toddlers and book groups, serves as home-base bookstore for more than 60 published local authors> Collection includes literary fiction, biography/memoir and history, travel, education, poetry, and arts> Children’s room from toddlers to teens> Margot Sage-El store’s sole owner, at present location since 2001. 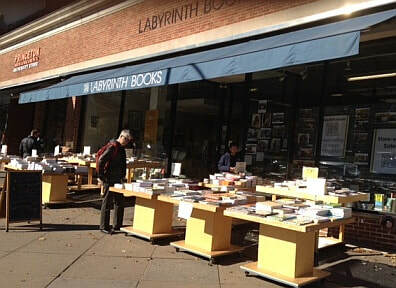 Located across street from main campus of Princeton University, carries wide collection of assigned books for Princeton courses (with some available for rental), novels, history, art, poetry> Also Princeton memorabilia, frequent author readings, talks and signings. ​Consignment shops selling gently used men's and women's clothing and accessories less than 3 years old and on trend–accepts women's sizes 00-24 and men's sizes XS-3XL> Also lightly worn shoes, jewelry> Does not accept lingerie, worn swimwear, maternity, faux designer goods, bridal or evening gowns and most in-house chain store lines> Standard 40% commission on accepted items for sale> Readers Choice Award 2017, Philly.com. Upscale consignment boutique specializing in designer and boutique labels in women’s clothing, shoes, handbags, jewelry and accessories> Lines include Hermes, Louis Vuitton, Chanel, Gucci, Prada, YSL, Fendi, Theory, Vince, Alexander Wang and J.Crew> Shoes from Jimmy Choo, Manolo Blahnik and Prada> Events include in-store champagne tastings, fashion shows at charity fundraisers and private parties. Very high-end furniture and full interior design and decorating services> First opened 1952 in Paterson by brothers Alvin and Jimmy Greenbaum, remains in family ownership> Originally specialized in early American furniture, since expanded with contemporary lines from over 2000 global sources, offers interior design services, custom furniture design and restoration> Also designs and makes custom-styled and sized pieces with over 30 on-site designers and craftsmen, original Paterson location now site of workroom, warehouse and trade showroom. Founded 1994, now located in restored livery stable in two-level, 7,000 square foot space> Expanded from original focus on antique pine pieces to offer contemporary collection, along with custom design and interior decorating services> Also chandeliers, fireplace surrounds, original art, hand-loomed rugs, cowhides, bed linens, dinnerware and accessories> Eight interior designers on staff, including owner Nina Karamallis> Designs and builds custom cabinetry, tables, vanities, bookcases, bars hand crafted in solid cherry, pine, oak, maple and walnut. Rob Amend and Michael Yavorsky> Mix of classic, modern and globally-influenced home furnishings, with emphasis on unique selections> Features Adriana Hoyos Collection scultptural line of furniture crafted from fine woods and exotic materials> Also offers interior design services for complete renovations and makeovers, as well as furniture, accessories, lighting, window treatments, wall art and rugs> 2017 NJ Monthly Best Home Furnishings Store in central NJ. In fourth generation of family ownership, founded 1935> Services global design community, hotels, healthcare/assisted living facilities, restaurants, country clubs and corporate clients> Main office and 50,000 square-foot manufacturing operation located at original site in Paterson, management and quality control team in China and representation throughout US, United Arab Emirates and Canada> Provides in-house CAD design, drawings, model-making and concept development, manufacturing includes wood working, custom finishes, and quality upholstery. 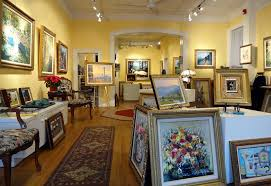 Originally opened in Manalapan 2003, relocated to present gallery in Red Bank 2015> Upscale collection of fine art and antiques, includes furniture, porcelain, tableware, lighting> Featured on cable TV and in national art and antique publications. Claims to have largest collection in NJ, 18,000 square foot showroom and warehouse> Pre-owned estate home furnishings such as Ethan Allen, Harden, Thomasville, Kittinger, Henredon, Hickory Chair, Pennsylvania House, Hitchcock> Also rugs, wall art, prints, mantles, clocks, lighting. Located in Lambertville central business district> Three floors and basement with independent dealers of furniture, ceramics, sterling silver, paintings, other antiques and collectibles> Upstairs working artist studios. "Southern New Jersey's Premier Ski, Snowboard, Bike and Swim Store"> Established 1969, consistently voted a Gold Medal Shop by readers of Ski Magazine and chosen as National Shop of Year in 2004, several other citations in national and local media, expanded into bicycles, swimwear, tennis, skateboards, golf> 4.5 of 5 stars from 9 reviews in TripAdvisor.com. Established 1891 by E.C. Kopp, oldest bicycle shop in America, second oldest in world> Full repair and service, custom fitting> Lines include Fuji, Breezer, Coinago, Bianchi, SE> Accessories, clothing, helmets, shoes. Began as single roadside flower cart in early 1950s, now annually delivers over 10,000 trees and shrubs and over 40,000 perennials> Specializes in unique and hard-to-find plants with one of largest selections on East Coast, also offers full landscape design and planting, large selection of statuary, fountains, garden stakes and decorative accents> Owner Rich Flagg son of Al and Velma Flagg, who built original store. Located at site of a home horticultural business originally built in 1807> Now 10,000 square-foot European glass greenhouse, 28 growing greenhouses, and 1.5 acre outdoor growing area> Grows nearly 3/4 of plants and flowers sold> Special services include landscaping design and planting; interior design and layout of plants> Garden Center with large selection of fresh flowers and wedding, birthday and event service, also gifts, statuary, pottery, baskets, birdbaths, home décor, and silks> Offers number of free horticultural classes.